My name is Grace Adler, and I am 46 years old. I am married to Scott (47), and I’m the mother of Samantha (15) and Jackson (14). Three years ago, I heard about CrossFit and thought it would be right up Scott’s alley to try it. He tried a couple of Saturday free WODs, and was ready to sign up for On Ramp. I wasn’t looking to change up my own workout routine, but I agreed to sign up for On Ramp to support Scott. A year later, we asked our kids to try CF Kids/Teens. As parents, our motivation and goals for them were to: 1)gain body awareness; 2) lay the foundation by learning to do the movements correctly; 3) introduce them to a lifestyle that they can embrace for the rest of their lives. After a year in CF Kids/Teens, they asked if they could do On-ramp and join the adult classes. My family has always been active. Scott is an endurance athlete: half/full Ironman triathlons, open water swims, and ski marathons. In my 20’s, I did bench press meets and 1 bodybuilding competition. In my 30’s, I did half/full marathons and sprint triathlons. In our 40’s, we started CrossFit. Our training used to be dictated by the races we signed up for. We weren’t the fastest, but we enjoyed a good challenge. Our children have been involved in sports: swimming, basketball, cross-country skiing, volleyball, soccer, football. After three years with CF, Scott and I are in the best balanced state of fitness in our lives. Our workouts are meaningful and compacted into a full hour each time. We continue to learn and we can see and feel the difference physically. I participated in the CF Open in 2014 and 2015 in the Masters 45-49 division. Though there is much more room for improvement, I moved up 170 positions worldwide between the two Opens. Our kids’ attendance of CF WODs depends on their sport seasons. When Samantha is in her high school swim season, she is not doing CF essentially from September through November. When Jackson is skiing and playing basketball, he may only fit in 1 CF WOD a week. When they are not in the midst of their respective seasons, they try to target 3-4 WODs a week depending on other commitments. After less than 1 year in the adult classes, Samantha competed in the 2015 CF Open in the Teen Girls 16-17 and Jackson in the Teen Boys 14-15 divisions. Samantha finished 14th in the North Central Region and 109th worldwide. Jackson finished 7th in the Region and 94th worldwide. In their respective sports during this timeframe: Samantha went to Division 1 High School State on a swim relay team; Jackson won the WI State Championship in cross-country skiing for middle school boys. They both believe CF played an important role in those achievements. On Ramp was fun and full of learning new movements. I remember great coaches who were patient and knowledgeable. It is critical to do the movements correctly and have sound foundation. It is important to know that the learning doesn’t stop when On Ramp is over. WHAT HAVE BEEN THE BENEFITS FOR YOUR FAMILY FROM CROSSFIT? 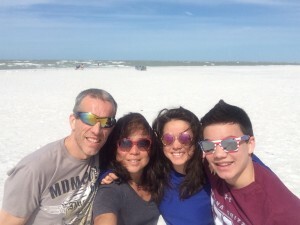 In addition to all the personal physical and mental benefits of doing CrossFit, it gave our family an unexpected benefit of connection. With our kids in their teenage years, it is at times difficult to find common grounds and interests. CrossFit is what they pushed to do and became one of our common interests. There is a healthy competition among us. We have naturally challenged each other to push a little more, go a little faster, and master a new movement quicker. It has been so fun and gratifying to workout with my kids (and watch them slowly surpass me)! Our daily conversations now include: What time is the WOD today? What is the WOD? Strategies about the WOD; results and reflections of the WOD; and general sharing of tips and coaching that we have learned. CF has also played a part in body imaging. Both Sam and Jackson will tell you that STRONG IS BEAUTIFUL! There are so many life lessons to be learned from CF for them (and us): 1) how to listen to your body; 2) how to adjust a situation to accommodate needs; 3) how to leave the ego at the door; 4) how to lift (not physically…except in partner carry) others; 5) how to be thankful and express thanks; 6) how to work hard and continue to improve; 7) how to eat well; 8) how to take care of your body; 9) how to handle a disappointing workout or lift; 10) how to do all this and still find joy in it and have fun. The CF community offers many amazing athletes that I am proud to have as role models for my kids. CF is unique in that every day is different. My body is not given the opportunity to adapt to a particular routine. It’s also fun that everyone at the Box is doing the same workout each day. CF is intense and I love that I can get a great workout in an hour. Posting WOD scores allows healthy competition and peer pressure. The community in CF is amazing, with everyone cheering for each other. To be successful in CF requires dedication, courage, regular attendance, and a little sense of adventure. The coaches are knowledgeable. They take the time to know the members and with that, they know how and when to push you. They are adamant that we do the movements correctly. They are always willing to help you find the appropriate modification. The members at this Box are just extraordinary people. This Box has sent a team to CF Regionals 3 years in a row, with last year’s team progressing to the CF Games…that tells you they are doing something right. WHAT ARE YOUR FAMILY’S GOALS GOING FORWARD? Be better than yesterday. Have fun. The kids want to do better in the Open next year and would love to someday go to Regionals and CF Games! Scott and I want to be healthy and fit to continue to do whatever we choose to do in life. My favorite CF exercises are all the ones I can do. 2015 is the year that muscle ups will become one of my favorites. Scott: least favorite – snatches; favorite – Hero WOD’s. Samantha: least favorite-running and rope climbs; favorite-deadlifts.